From the Montgomery Biscuits to the Lansing Lugnuts, do you ever wonder where those unique minor league team names come from? 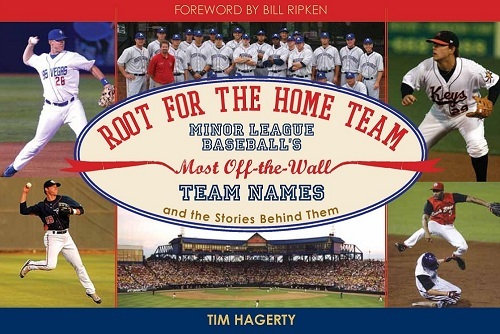 The book Root for the Home Team: Minor League Baseball's Most Off-the-Wall Team Names and the Stories Behind Them gives the backgrounds of the most quirky team names in Minor League Baseball history. You will see the humorous and sometimes surprising backgrounds of team names. Like how the Altoona Curve team name sounds like something a pitcher would throw, but actually takes its name after a piece of local railroad history. Or how the Wichita Izzies had a supporter so dedicated, they named the team after him. Root for the Home Team: Minor League Baseball's Most Off-the-Wall Team Names and the Stories Behind Them is a unique book any baseball fan will love.